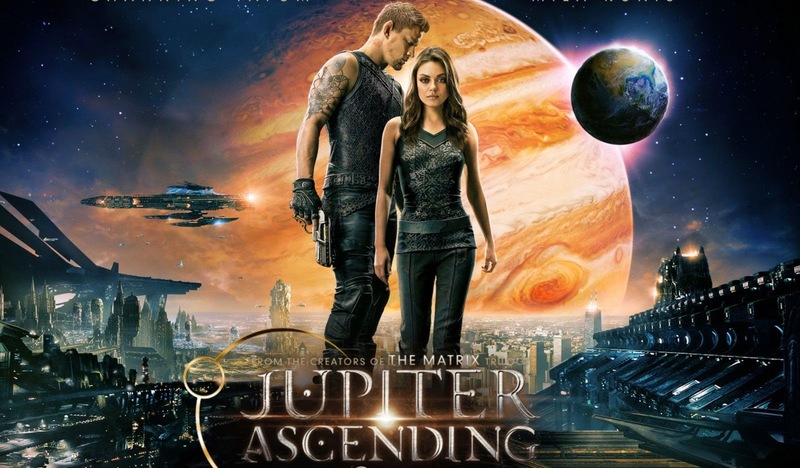 Jupiter Ascending is a quality American-Australian Sci-fi film that entered the box office in America on February 6th 2015. The film stars Channing Tatum and Mila Kunis, two very well known actors. The plot of the movie is centered on Jupiter Jones (Kunis), a young cleaning woman who works for her family’s cleaning service, and Caine Wise (Tatum), a warrior from another planet that informs Jones that her destiny extends beyond Earth. As the movie progresses, we see Jupiter and Caine begin to fall in love. As Caine helps Jupiter escape from intergalactic aliens trying to kidnap her, their connection grows strong. However, this love is put on hold when Jupiter is informed that she is supposedly the reincarnation of the dead matriarch of the universe (who happens to be the mother of three siblings who are fighting over her property- one of those “properties” being Earth). The three siblings try to persuade Jupiter to join their side of the sibling quarrel and it’s here where Jupiter falls prey to many forms of manipulation. Overall, the plot was thick and the character development was strong. One short scene in the movie, lasting only 8 minutes long, was outstanding in my opinion. The scene consisted of evil aliens trying to kidnap Jupiter while Caine tries to save her by flying all over downtown Chicago. To create this scene, the producers wanted the sky to look just right. To do this meant having to shoot every day for only 10-15 minutes when the sun was it the right place in the sky. To get this eight minute clip, it took approximately six months. This example shows the dedication and hard work put into this movie. In my eyes, all this hard work paid off. Jupiter Ascending is a film that will truly take you out of this world. One man is sure to impress with his spiffy attire on Monday morning at CVU. This man is Seth Emerson, the coach of the golf team and junior varsity basketball. He’ll be there to greet you with a smile, as he fills out the crossword. Putting an outfit together can be a feat in the early mornings before school is in session. Most of us manage, but few go above and beyond with good results. Clothing is what we put forth to the world: its our first impression. Each person has unique tastes and wardrobes. From punk chains and dyed hair to finery and formal dress, we all fall in somewhere. However, CVU newcomer Anthony Spagnolo, has rocked the boat and caused some commotion. Spagnolo teaches Physical Education (Life Team Sports and Personal Fitness) and has a similar style to Seth, with a fresh twist on the classic faculty look. Even Emerson admits, “On game days, he [Spagnolo] gives me a run for my money.” Although Emerson went on to verbally suckerpuch Spagnolo, mentioning his tendency to wear sweatpants. in Seth’s opinion his victory over the young upstart Anthony. However, the rivalry between the two CVU faculty members acts less like a battle and more like mutualistic competition, each pushing eachother to look sharper, better. Friendly jabs and motivating criticisms are always present. Only time will tell who will slip and who will take the lead of the neverending race, I guess we’ll see next game day.